If you’re after some interesting period artwork, check out the London Transport Museum online store – it’s packed with vintage artwork relating to London’s transport system, including this 1971 Piccadilly to Heathrow poster. 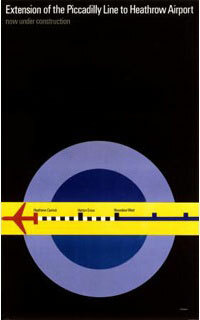 It’s the work of Tom Eckersley, one of Britain’s leading poster designers from the 1930s through to the 1970s – with this one produced in 191 as work commenced to extend the Piccadilly line to Heathrow (which was completed in 1977). A great piece of design, sized at 20 x 30 inches and selling for just £9.95.